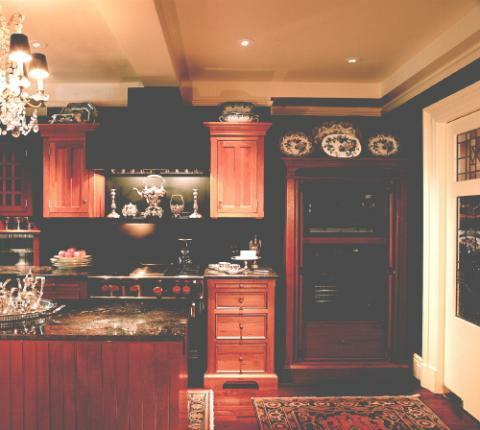 The Kitchen features eight separate furniture pieces, including natural wood armoires and a granite topped island. Offering classic details and a mix of wood finishes, the handcrafted furniture enhances the space while sleekly concealing the appliances. In a large Armoire a Subzero 700 (15 cu. ft.) refrigerator and a full sized (15 cu. ft.) freezer is divided by a full height pantry with roll-out trays. On the Sink workstation, grid pocket doors conceal a standard dishwasher, and sliding reeded glass doors above conceal the coffee maker and blender. The breakfast table, located in front of a large expanse of shuttered windows, provides an elegant place for intimate meals, due to the formality of its surroundings. The wall oven and microwave are concealed in a Pie Safe, one of YesterTec’s enclosures that features U.L. Listed safety features that only allow the appliances to operate when the flipper/pocket doors that hide them are opened and stored beside the appliances in a pocket. Even the Wolf range was brought back into the world of furniture by flanking it with identical sets of workstations. The remainder of the apartment also uses furniture instead of cabinetry whenever it is possible.The library has freestanding floor to ceiling bookcases with glass doors instead of built-in shelving. The powder room has an antique storage piece and as the owner learned, Kitchen Workstation Furniture can maximize storage and function in other rooms as well. 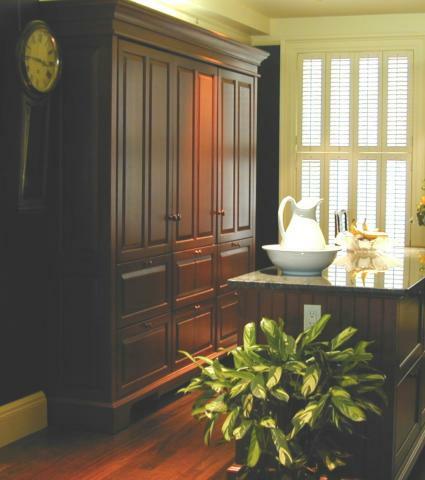 One of the main bathrooms containing a pedestal sink has a YesterTec Cupboard with a flip-down countertop that is used as a vanity. And in a nook (to the left of the shuttered kitchen windows), a large Working Pantry/Armoire that features a concealed countertop stores dishes and food. This area also contains the elevator, so in effect it is the entrance to the apartment and needed to have a more upscale appearance than just a typical ‘mudroom’. That’s why the owners chose the elegant YesterTec piece. 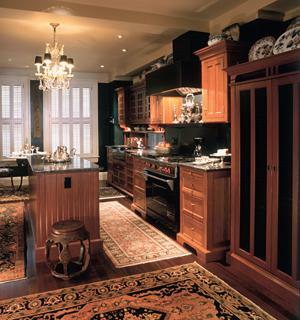 An Eclectic Informality creates a Formal Kitchen. “After talking on the phone several times and creating the layout of the kitchen, we started to have fun styling her pieces,” says David. “That’s when I discovered that her taste was quite eclectic but very formal at the same time. The furnishings in her home came from all over the globe as did the various collections that she wanted to display. So selecting different woods and door styles for each piece created an informal mix that made real sense for her. Adding the formal silver service located above the range, the chandelier and the oriental rugs created an informal formality which is so appropriate since the kitchen is wide open to the formal dining room”(located to the right of the pie safe). David continues, ” One day, about 2 years after the kitchen was finished, I got a call from the owner. Apparently, her husband was tired of her gushing about how much she enjoyed her kitchen that he made her call me! She said that she had never had a kitchen that was so efficient to cook in and so full of storage.” Great to hear, because the lack of continuous counter space and top cabinets is the first concern for all the people who are considering furniture instead of cabinetry for their new kitchen. But because the workstations are deeper around the major appliances, some with higher/additional counter tops (like the sink piece) and some with full height storage (like the refrigerator/pantry) YesterTec pieces are more efficient per lineal foot than 2 foot deep cabinetry. The idea is to make each piece more functional to do the tasks it is designed to do, and still maintain the balance and proportions of a beautiful piece of furniture. “When designing complete kitchens I try to encourage my clients to leave more space between each piece than is shown in this kitchen,” says David. Because each piece is so 3 dimensional, it is better to leave more space between them that can be filled with low storage pieces or tables or just shelving or other uses such as a chair for reading or perhaps even a dog’s bed. 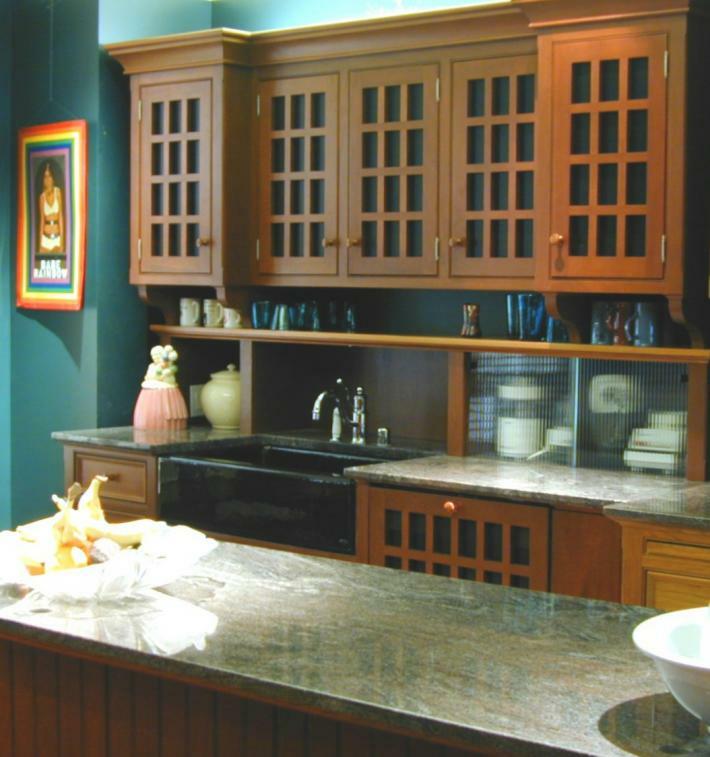 But because the styling, colors and heights of these pieces vary so much, this kitchen visually works well anyway. And the entire room is absolutely striking as the dark wall colors accentuate the individuality of each sculptural piece while holding the entire ensemble together. “And that is what is so fun about designing kitchen with furniture,” says David, “Every new design is as different as every client. The more involved they are with the design, the more unique it becomes.” And the outcome is always so different than a kitchen that is filled with just cabinetry and continuous counter tops. Next ArticleLuxury Kitchen Design for Not-So-Luxurious Budgets!